Meet Me At the Junction……for Dinner! Junction Bistro and Bakery is now open for dinner. This Mount Vernon Avenue gem in the Del Ray section of our fair city opened in 2016 serving house made breakfast and lunch fare as well as special offerings on the weekends for brunch while concentrating on fresh baked goods at the same time. “We wanted to launch dinner because of a strong demand from our customers. A lot of guests that already join of us for breakfast and lunch can now add dinner to their rotation and those who can’t make it during breakfast or lunch now have an opportunity to come in at the end of their day. We’re excited to give guests who may not be able to come into Junction during the week a chance to do so,” Proprietor, Noe Landini tells us. Many of you will remember that the OTC featured Junction’s Executive Pastry Chef, Jonni Scott, in the Masters of Cuisine profile a few months ago. Since then they have brought Chef James Duke into the fold to give special attention to their savory offerings. 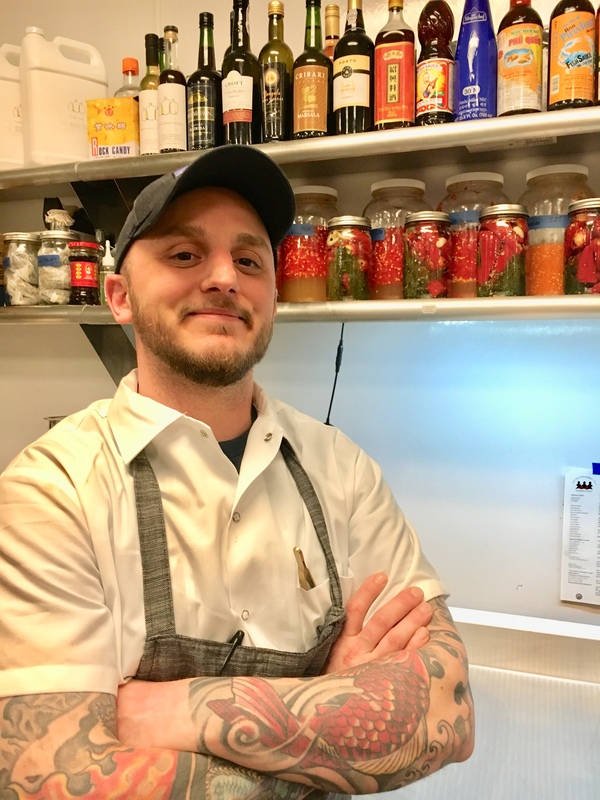 Chef Duke is a Northern Virginia native and comes to Junction after his most recent post as chef de cuisine at the Salt Line in DC. He has known Noe Landini since childhood and his first job in the hospitality business was as a bar back at Landini Brothers Restaurant in Old Town. When approached by Landini to take on the title of Executive Chef at Junction, Duke said he just couldn’t turn down the opportunity. When Duke took the reins, he designed the dinner menu with Junction guests – families and busy professionals – in mind. Dinner at Junction aims to be low-key and low-stress. 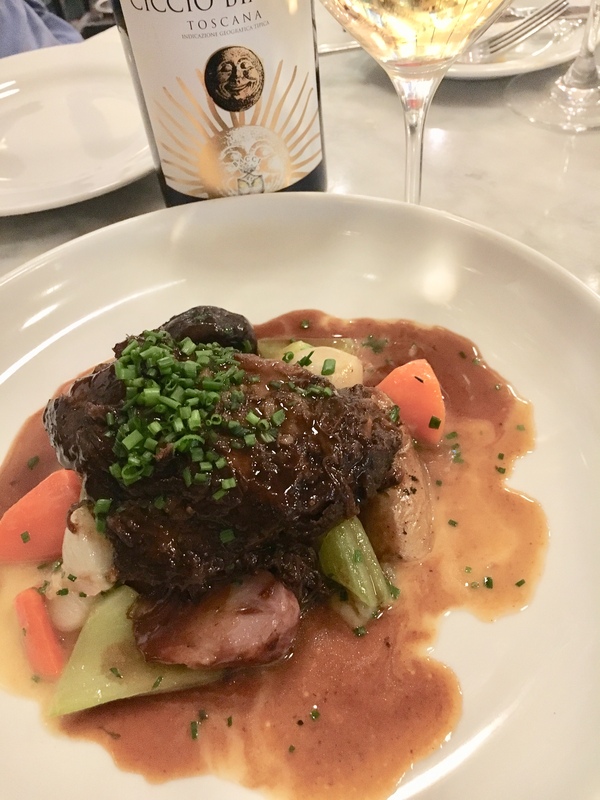 The menu incorporates Junction classics that regulars have come to love in addition to elevating some of those favorites. 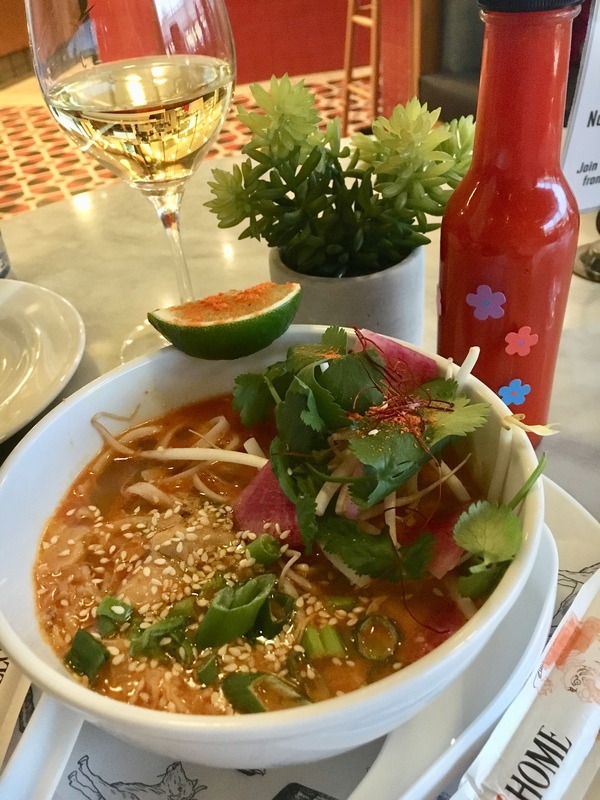 Duke has put his own stamp on the menu with items including Thai Street Noodle Soup (see photo) featuring vermicelli, shredded chicken, coconut, Kaffir lime, red curry, scallions, cilantro, Mung bean sprouts, and watermelon radish, an ode to the Asian cuisines he came to love growing up in Northern Virginia. Duke will also be highlighting Junction’s outstanding in-house bread program by offering a Junction Bread Basket featuring baguettes, brioche rolls, and whole wheat baked fresh daily with a rotating selection of house made butters. Duke plans to continually refresh the menu, adding new items based on current inspiration and the seasonality of ingredients. 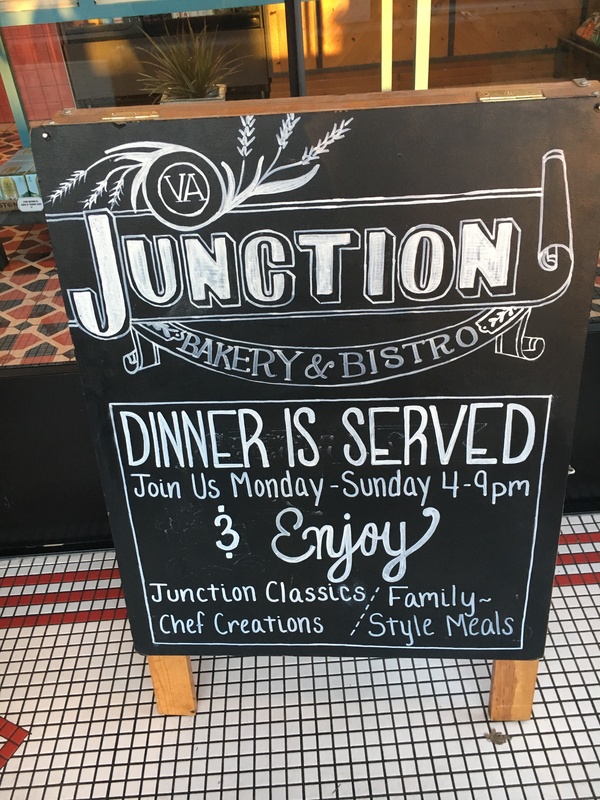 A menu feature that Duke is particularly excited about introducing at Junction is the family-style dinner option – available both for dining in and to go. Including Homestyle Roast Chicken featuring a half or whole chicken roasted with fresh herbs, butter, and garlic served with fingerling potatoes and an assortment of dipping sauces and a field green salad and Family Style Pot Roast (see photo) with boneless short rib accompanied by glazed root veggies, pearl onions, and a field greens salad are available as a personal serving or for 2-3 adults. This is a stellar idea for the family that doesn’t have the time or the energy to pull together a hearty meal after getting home at 7 pm. A simple phone call to the restaurant and you will have your fresh made hot meal waiting to be picked up. Lastly, Duke has turned an eye to elevating the retail options in the Junction market by adding more house made ingredients including DC’s favorite mumbo sauce, fermented hot sauce, and house made giardiniera and pickles. Duke plans to add additional retail options including scratch made sauces and vinegars for at-home meals. 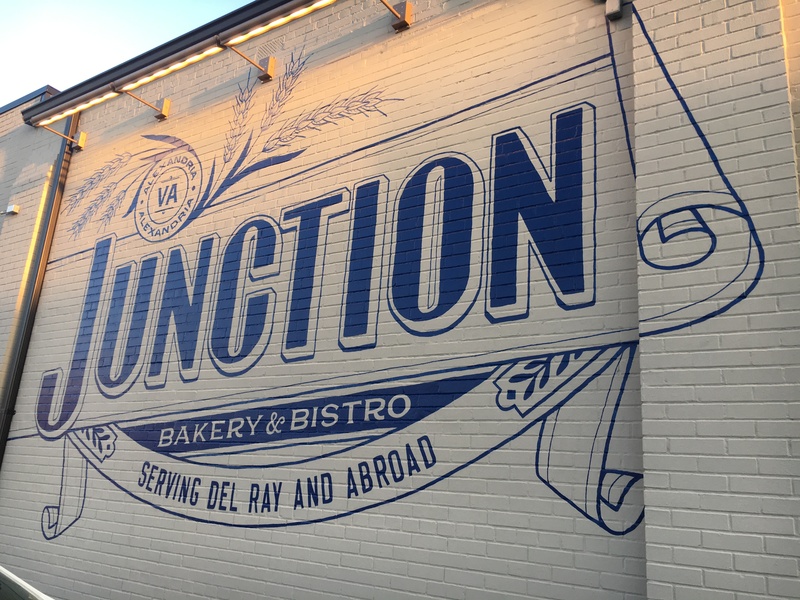 Junction has added some cocktail options in addition to their wine and beer selection for dine-in guests. Currently on the menu of the rotating cocktail selection are a draft version – “Gin-Da-Mom” featuring Sipsmith gin, grapefruit, lemon, black cardamom, chamomile, and hopped grapefruit bitters – and the Junction’s take on the classic cosmo, the “Un-Cosmopolitan” made with Tito’s vodka, cointreau, lime, and spiced cranberry juice. Rounding out the selection is an Aperol Spritz consisting of Aperol, Zardetto Prosecco and sparkling water. We didn’t try any of these, which is way odd since one of us is a gin drinker and the other a vodka queen. You can be sure we will give them a test run the next time we are in. We opted for a bottle of wine instead. As far as the food is concerned, we didn’t approach it in our normal way. Chef James is a bit like family to us so we just let him pick and choose some of the items that he has added to the menu for us to sample. It’s too bad everyone can’t do the same thing. We sampled the aforementioned Thai soup and the Pot Roast in addition to the Memphis-ish BBQ Pork Ribs, Malaysian Curry (vegetarian sample), Hot Fried Chicken sandwich served between a cheddar chive biscuit with aged honey, Louisville Fire sauce and house made dill pickles. We dined on “Taco Tuesday” so had to give the Al Pastor a try – roasted pork with pineapple salsa, pickled red onion, salsa verde, chipotle aioli and cilantro on a soft white corn tortilla. You have your choice of three (pork, chicken and veggie) for a mere $10. Everything hit the mark with us with the exception of the Malaysian Curry. Neither of us are curry or tofu fans but the chef wanted us to try a vegetarian dish – I imagine for those of you who are wild about tofu and curry it will be a small slice of heaven. Guests order at the counter and either belly up to the island or take a seat at a table and wait to be served. There is limited sidewalk dining so when the weather clears up, you will have to get there early in order to secure a seat. All orders are available to go. Pricing is comparable to other establishments in the area and the portions are generous. Be sure to check them out if you haven’t already! Dinner at Junction is served from 4 to 9 PM Sunday through Monday.